Have been following you for several years now and now I have one question. How did financial crisis influence rental prices for small apartments? I am thinking of buying loft to create small apartments (30 to 60m2) to rent them out. Therefore I am interested to know, how how rental prices were doing during the initial crash, during “recovery” and how they are doing now. Maybe you have some links to rental price graphs or something similar. Thanks a lot for the job you are doing! It really helps people around the world. And unfortunately – the further we go, the more it helps! In the case of Argentina, the prices pretty much followed inflation, and by this I mean they followed the real inflation, not the much lower official one. This is important when you consider that we’re talking 30% to 40% inflation each year in Argentina. In most modern day economic collapses and crisis we see something similar going on. It’s interesting to notice that while property prices may drop, in some areas more than others of course, you rarely see rent prices drop much. Especially for the kind of property you are thinking of, an apartment or condo, probably in a larger city center. Sometimes people are surprised by this but when you think about it, it does make sense since its closely related to the rule of 3: You cant live 3 minutes without air, 3 hours of exposure to extreme conditions without shelter, 3 days without water or 3 weeks without food. Rent is basically modern-day shelter and unlike selling prices it’s something that the lower income class will depend more on. Of course there are squatters and such but in general you get the picture. When it comes to food, water and shelter (housing) those are pretty basic necessities so it’s usually considered a pretty solid investment. With bigger houses, and further away from town, there’s usually more offers and more room to bargain, but if you need to be in town for work or study then you’re already talking about a more limited segment. Of course, it has the advantage of eliminating the need of commuting, which in hard economic times is a valuable asset. A small apartment for rent in town in a good area makes for a good investment in my opinion. M.D. 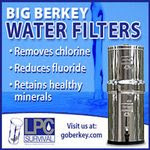 Creekmore, of thesurvivalistblog.net, recently launched a new site called The Daily Collapse Report. It has plenty of interesting articles and news updates so check it out! M.D. and I agree on several key aspects of what realistic survival and preparedness is all about.This blog post of his “Warning: Do You Recognize these Five Common Piles of Prepper BS” addresses several of those common views. I’ve been moving away from li-ion batteries this year. The technology is there now for AA lights. With the exception of very high lumen output, there’s really no need for the CR123/18650 lights anymore. And, the very high lumen lights are rarely needed. Oh, there’s love for Lithim Ion batteries. I’ve found that 16340 batteries don’t always work very well in my CR123A lights but still, I sure like them and in all these years 1xCR123A types have been the flashlight I’ve carried the most, even in Argentina where they are even harder to come across an more expensive. So sure, I guess that makes a strong case for them. Also, my night table light for when things go bump in the night is a +1000 lumen 18650, again, a powerful flashlight that fits such role very well. BUT, and here’s where I have to be honest with myself and my readers, I still make sure I have a 1xAAA with me at all times. In a worst case scenario where my house keychain is all I have to work with, I’ll have an Olight i3S 1xAAA light. The way I see it no matter what you do you should always have at least one AA or AAA light, and if you’ll carry just one, make that one a AA or AAA. If you have a second light make it whatever you want, expand into a powerful, potentially tactical-use light, but first cover the basics. Why a keychain AAA instead of say, a keychain CR123A which would work on standardizing my battery use? Because I know that in a worst case scenario I’m far more likely to come across AA and AAA. If after a large scale disaster I have to get by with whatever I have in my pockets, I know that in some hotel TV remote control, some old toy, somewhere I’ll find at least one old AA or AAA with some juice still left in it. If I can find fresh batteries, then its not hard to get well over 100 lumens out of a single AA EDC flashlight. Its nice to have options, so I have lights that work with all of the batteries mentioned so far and then some. I like having those options and each works great within its specific role. But if you want to simplify your logistics you can have a core setup working exclusively around AA and AAA. 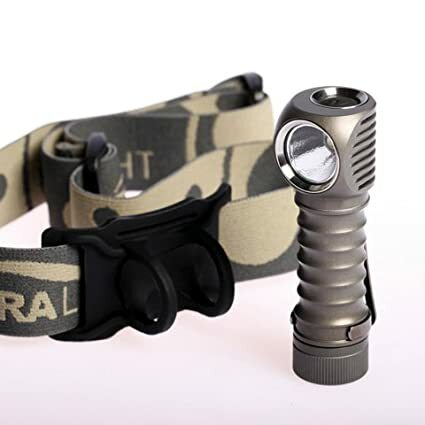 These days you can have an EDC light, a headlamp, a keychain light and a powerful tactical flashlight all running on AA batteries. With a few rechargables you’ll feed those puppies practically for free for years to come. Part of a modern survival mindset is trying to simplify logistics as much as possible so that fewer parts and supplies can be used in the most possible scenarios. The use of batteries for electric appliances is such a case. Ideally, we would have our electrics running on the same batteries, and that type of batteries would be affordable and popular. AA batteries being the most prolific and powerful enough for most applications are usually a good candidate. Problem is, when you want maximum performance, you’re usually forced to go with lithium CR123A batteries, which are expensive and not as common. Thanks to the constant advance of LED technology, this gap becomes smaller each year. 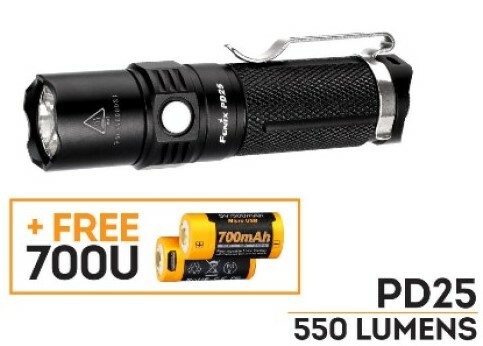 Today, we already have +150 lumen flashlights running on a single AA battery which was unthinkable just a few years ago. In the case of the Thrunite TN4A, we have a flashlight that while still operating on cheap AA can produce 1150 lumens on turbo mode. 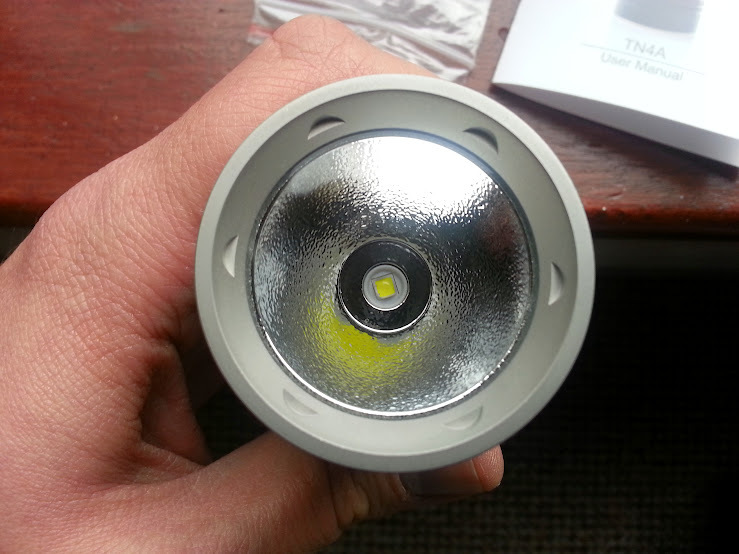 The Thrunite TN4A goes into that high lumen output category that was once exclusive to lithium powered lights. Not only can you use AA found in any gas station or toy store, you can keep your light for use around the house with rechargeable batteries. A low power indicator LED in the side switch will tell you when the batteries are running low by going from blue to red when being used. When Turbo brightness is needed, simply double clicking the switch will provide 1150 lumens. Double clicking again activates the strobe mode. This makes for a quick access of both the highest output mode and the strobe. When in less of a hurry, turning the light on and then long pressing the switch cycles through low medium and high, with a memory function remembering the last one you used. Turbo, Strobe and Moonlight are not remembered by the memory mode. 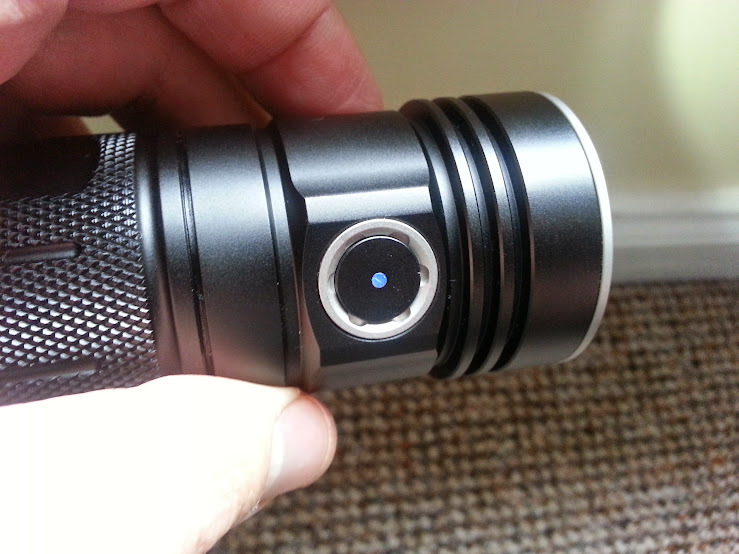 To access the Mooonlight 0.5 lumen mode, you long press the switch when the light is off. This works well when you don’t want to disturb anyone by turning the light on and the cycling through various modes until you find the lowest one. The Moonlight mode is fantastic for when going without power for long periods of time and runtime becomes key. 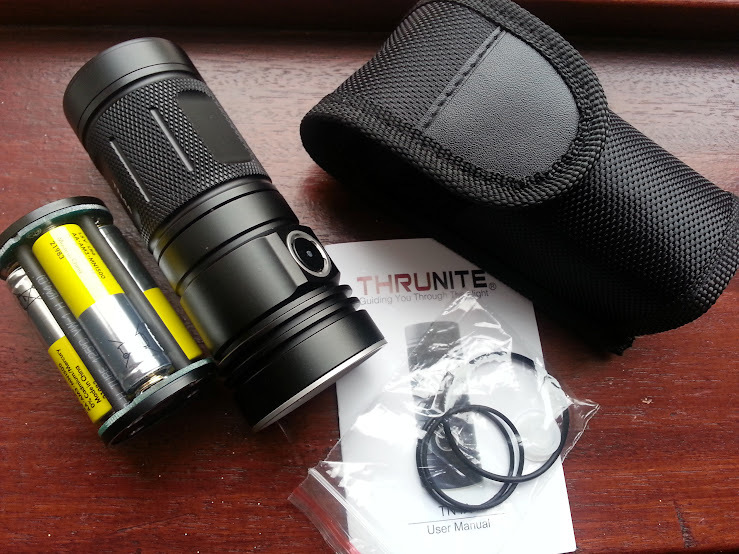 The Thrunite TN4A is a well-made flashlight selling for a very competitive price of $55.95. It uses the latest CREE LED, the XP-L V6 LED with a lifespan of 20+ years of run time. It’s impact resistant to 2 meters, waterproof to IPX-8 Standard (1.5meters) and comes with a holster and spare o rings. If you are looking for a compact thrower that runs on cheap AA give it a try. Hope I can provide you some inner view of the situation. Yes, ruble felt up to 80 rubles per $ at Tuesday, but two days later 1$ is 59 rubles and price is doing down. This was clearly a speculative attack against national currency, because there are no fundamental reasons for such a drop. Actually, some people (who don't have much rubles on hands) just laught, others spent money on large TV, new cars or something like this. We have survived at least two such crysises - at 1998 and at 2008, and currenty we don't see anything worse than in those years. Thanks for the first hand account! It does sound similar to what people do in Argentina. Keep in mind that over there there's 30%-40% inflation, so they try to "get rid" of money as fast as they can. TV, car, those that can, real estate, but the idea is to buy something before inflation destroys it anyway. Here' s video I did about my opinon regarding what's going on right now. approach to “survival-ism” I’ve encountered. be interesting, to say the least, to watch what happens in Russia. Thanks Robert for your email, I’m glad you liked my book! 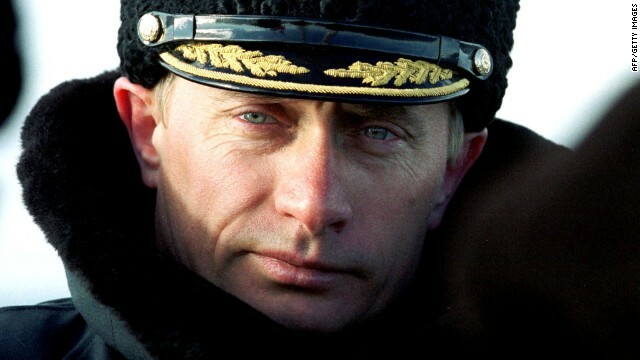 The situation in Russia is interesting and it can get worse, not only for Russia but for the rest of the world as well. If Putin goes for the old trick of fueling conflicts with other nations so as to deviate attention from local problems that could be bad for everyone. That kind of inflation sure is a problem, but Russia is still capable of dealing with it. Argentina has been getting by with 25% -30% inflation every year for the past decade. Russia is also bigger and has a stronger industry, so I wouldnt be surprised if they can deal with that kind of inflation for some time. The price of oil dropping sure isnt helping him and today’s news of USA now being in good terms with Cuba is another blow for Putin. You lose allies, you lose money, it could get pretty desperate for him. Lets just hope he doesnt do anything too crazy. This is what I love about preparedness. There’s always something new and interesting to learn. A few days ago I asked what would be the human equivalent of kibble dog food, something you can simply eat the same of every day and it would keep you alive and healthy. Turns out there are fancy meal replacements but there’s also true human kibble as well. Cheap, easy to prepare and it keeps you alive and healthy. Its called Fameal, which is a general word for a food product that is made of a wheat-soy meal blend of a cornmeal-soy blend (WSB or CSB). This is a food used by NGOs to feed people in some of the poorest parts of the world in Africa and the Caribbean. You know those pictures and clips of starving children being fed a white paste of some kind? That’s likely CSB or WSB. So, what is it made of? Turns out it’s not that different from the rice and lentil recipe I mentioned before. 50% Cornmeal or Wheat Meal. 30% Bean meal, of any kind, including soy. Lentils are sometimes used due to ease of grinding and fast cooking. 10% Cooking Oil. Any cooking oil works. 10% Sugar, honey, syrup, or similar sweetener. Multi-vitamin powder, or multi-vitamins ground to a meal. Fameal can be used in soups, just eaten with added water or made into breads and cookies. Fameal is pre-cooked and processed so as to make preparation easier in the poor locations where it’s needed. Still, the ingredients mentioned above gives us a very good idea of what you need so as to have a core food supply. Something that may not be fun to eat every day, but that it will keep you alive: 50% of corn or wheat, rice could be used to, 30% of beans or lentils for proteins, 10% vegetable oil and 10% of sugar, honey or syrup. It doesn’t sound like much, but these along with a multi-vitamin tablet will be you alive and going for a long time. 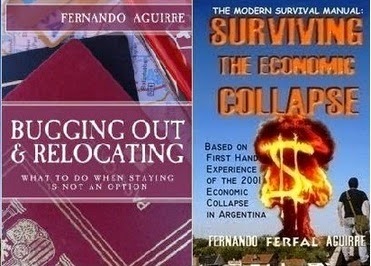 I loved your 2 books, they were both very helpful. It was worth the wait to get your Bugging out and Relocating book. I know you mentioned about virtual kidnappings crossing the South American borders into the USA . welI I just received a warning from the pinellas county (Florida, next to Tampa) sheriffs office warning that a guy has been calling up people pretending to be a paramedic asking for the next of kin for the fake kidnap victim. then once he gets to the person he was calling for he says he has kidnapped the loved one and wants so much money to return them. I just wanted you to get the word out to warn others this is happening in USA so beware. Thanks J for the heads up. The method sounds exactly like the ones I’ve seen used in Argentina many times. There are variations sometimes but the one you explain is very typical: A family member suffering an accident, someone theoretically calling from the hospital or police station. Sometimes they will call and tell they have your son or daughter hurt and unable to talk just right next to them. “Is Mike ok?” There, you just gave them your son’s name without even realizing it. They are very good at this, very convincing. They call asking to verify if they got the right number, the right name, the right address. Little by little they get important information out of you. Sometimes they call a few days ahead of time pretending to work for consulting companies asking various questions. Again, its just work they do that will be used later against you. Sometimes its people that actually know the victim and know he’s maybe traveling or otherwise unable to be contacted. Its important to be very careful with children. I heard a recording from a convict doing this kind of crime even from within prison. He would randomly call numbers and get information. During one call he contacts a small child, in just seconds the child tells his own name, his parents, if he’s home alone or not and even where he lives. Be careful out there folks. Scams happen everywhere. Last year someone called me pretending to be from my internet provider company warning me about a virus and calling to help me install an anti-virus program, most likely a Trojan program that would give them access to my computer. “Really? Since you are my internet provider, what’s my name and where do I live?” I had a good laugh with that guy. He wasn’t very good and he got nervous and hanged up as soon as he saw I knew what he was up to. 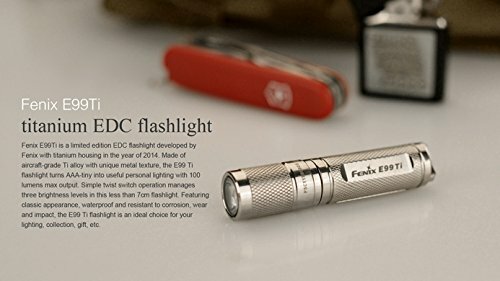 Fenix has their E99 Ti Titanium 1xAAA on sale right now in Amazon going for $35.95. This sale wont be lasting long. That's a great price for a limited edition Fenix Titanium 100 lumen keychain flashlight, and it comes in a nice presentation gift box. I'll be getting the Thrunite Ti soon, also titanium and using a single AAA but I'm not sure if I'll get to review it before Christmas. Well, turns out they DO make kibble for humans. Seems there’s an entire market of “superfoods”, non-GMO, animal free, dairy free food that tastes awful but provides all the nutrients you need and none of the things you want to avoid. Garden of Life RAW seem to be the best-selling one, but there are other products as well such as The Ultimate Life – The Ultimate Meal and the ridiculously expensive Soylent. I imagine it can get as boring as hell but I do like the idea of just incorporating fuel to the body, premium fuel at that. The problem I see besides what seems to be an extremely nasty taste (that I can live with) is how ridiculously expensive they are. If they had a good product for a reasonable price then I’d be more interested. For the meantime, I’m sticking with my version of kibble for humans: rice+lentils + veggies. 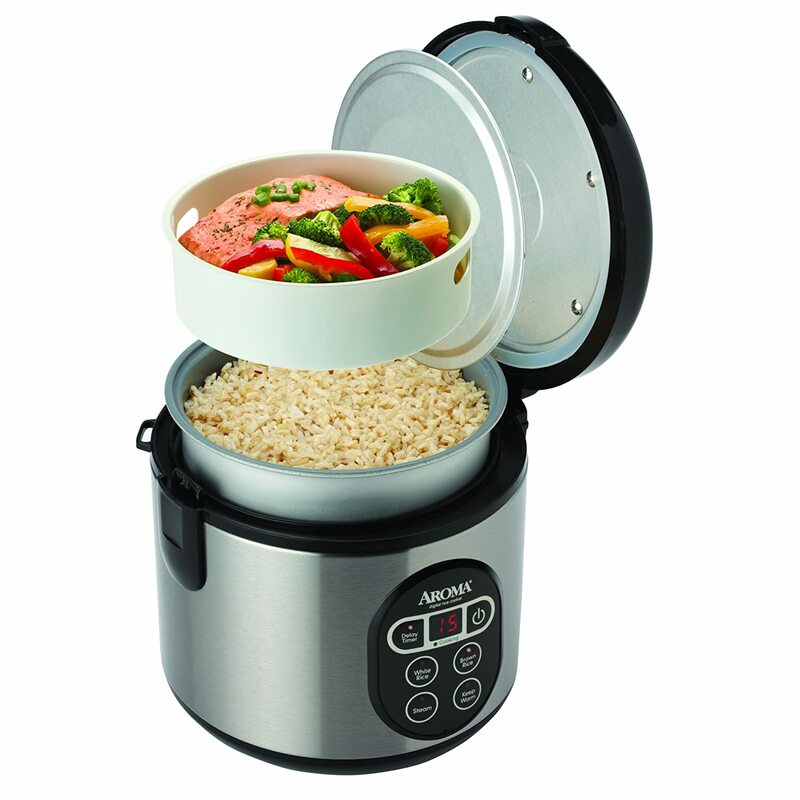 1)Get the following: A Rice cooker, lentils, basmati rice, vegetables. 2)Throw the ingredients in the cooker along with the amount of water that your cooker’s manual indicated. 4 cups of water for 1 cup of rice is about right. 3)Relax and wait until dinner is ready! Many of these cookers have an automatic off function. It takes a bit getting used to but you eventually get the hang of it. The rice cooker won’t have a problem with anything else you put in there as long as it requires similar or less cooking than rice. Lentils cook in about the same time as rice. Beans may require an extra cup of water so as to cook a bit longer but its worth trying. Vegetables are not a problem. We’ve been eating this way for months now for one of our meals per day, usually lunch, and so far we are happy with the results. It’s simple, healthy, and rice gives you a good foundation to work with. You can try different combinations, different vegetables, beans, different spices, etc. It also works great for both winter and summer. For winter meals eat as soon as its done for a nice warm meal. Try sprinkling a bit of cheese which will melt on top of the hot rice as soon as you serve it. For summer meals you can serve and let the rice cool for a cold light dish, maybe served with tuna and sprinkled with lime. Folks, just a few more ideas. Rice and lentils sure have a place on your preparedness plans but you can start eating (and stockpiling) now. My dog eats the same stuff everyday. Its good store bought dog food. I feed him a bit every day and he's in fantastic shape. Sometimes people have mentioned the idea of kibble for humans from a survival perspective. What can I have that I eat every day and keeps me alive and well in spite of eating the same thing every single day. Supposing we don’t care about how boring it may be and just thinking of it as body fuel? As far as I know, there's no such thing, but combining a few food items you can cover your nutritional needs. What's the minimum food combo that would keep you fed and healthy? What’s your idea of human kibbble food? Rice and lentils have kept people alive for generations, at times people eating those exclusively for months, even years, and still getting by. Rice and lentils form a “complete protein”, which makes it an ideal meat substitute. Rice and lentils also cook at about the same time, making preparation fast and straight forward. Regarding which rice is best, Basmati brown rice is probably your best bet. Brown rice has more fiber and more nutrients than white rice but at the same time brown rice has more arsenic than white rice. Basmati rice is known to have a lot less arsenic than American rice, making it a good choice. What you want to do is complement your rice & lentils “kibble” with as much fresh fruit and vegetables as possible in your diet. Vegetables can go straight with the rice and lentils into delicious stews. At the very least, if all you have is bags of basmati rice and lentils, these along with a multivitamin tablet will keep you in very good shape for la long time. Something similar over at EDCforums. A number or reasons can cause your ferrocerium rod to decay/oxidize. It can be related to humidity, salty environment, even the gases produced by batteries kept in your kit. The results vary from pitting to complete rods turned to dust, leaving you without your trusty firestarter. This can happen both in generic ferrocerium rods and well-known brands. Cheaper rods may have a greater amount of iron, which rusts easily and may degrade the rod quicker and more extensively. What can you do? Check periodically, keep it in a sealed bag. If your rod has been used and the protective layer removed, you may want to add a layer of paint to protect the exposed surface. Buy a thick rod and buy quality, something like the Light My Fire Original Swedish FireSteel. Above all, have a backup! I know that for a lot of people their firesteel IS their backup, but don’t forget a Bic lighter and some strike anywhere matches in a ziplock bag just in case. Folks, Cybermonday is the last day of offers in Amazon for many of the deals I mentioned in the Black Friday post. Here's the link to the Cybermonday Deals in Amazon. Its worth looking around and grabbing a deal if you need anything. Also, today is the last day of 30% OFF for any printed book using the code "HOLIDAY30" at checkout under the "Gift cards & promotional codes". It’s a nice discount if you want to get one of my books or any other printed book in Amazon. I thought I’d heard it all but this one is unbelievable. I’ve mentioned many times how bad the crime situation is in Argentina and how badly equipped police officers are. In spite of their best intentions they tend to be poorly trained and equipped unless they provide both themselves. They get little or no ammo for training, body armor vests are unavailable or in bad condition. The same goes for patrol cars. In most police departments across the country they have a shortage of police cars, many in need of repair. A police officer told me that even for the vehicles that work, they don’t have enough gas to patrol the streets every day… so they have to pick three or four days a week to patrol the streets. In some cases they just keep enough gas to respond when they actually get a call and patrolling is simply not within their budget. So, what do you do with a police car that isn’t working? Well, in the civilized world you would fix it, but in Argentina the chief of the local department just rents it to companies, warehouses or gated communities as a scarecrow. They leave the vehicle parked in front of the location they want to protect, maybe turn on the lights at night. If the car isn’t working at all, maybe they connect the lights with a battery and a couple cables, so as to at least dissuade criminals. It is of course illegal to do this. 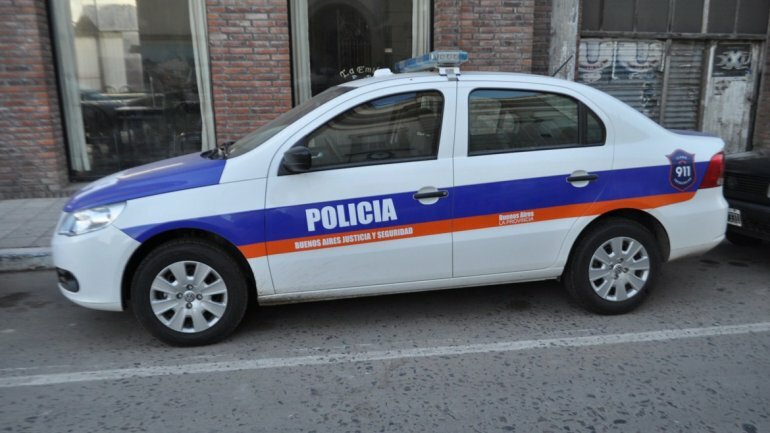 The police and its assets should serve the general public and not be rented away to those few that can pay for it, but then again, its not as if this is the worst we’ve seen happen in Argentina. I just think the entire scarecrow patrol car is pretty weird, but I guess it may work on some level. Maybe it’s something to think about. Buying an old patrol car or getting some of the blue cop looking lights mounted on a vehicle that looks like a police car and leave it with a timer so that the lights turn on at night or when you’re not home?